With apologies to the portability of the jigsaw, the band saw is widely considered the best choice for making curved cuts in wood. However, band saws can do a lot more than just cut curves. Knowing a variety of techniques for cutting with your band saw will increase the tool's versatility and give you more options when needing to decide how to accomplish specific tasks in the woodshop. Of course, the band saw's forte is making curved cuts, and knowing how to cut precise curves on your band saw will allow you to accomplish a variety of woodworking projects you might otherwise not be able to complete. You can change a band saw blade and tension it properly in a couple of minutes. Proper tensioning for the specific blade size will minimize deflection and help prevent breakage. Once you've changed the blade, adjusted the tension and set the tracking properly, you can prepare to cut your curves. Begin by verifying that the band saw's table is square to the blade by checking the angle between the blade and the table with a combination square (that is, unless your cut requires the table to be set at a specific angle). Then, mark out your curve on the board with a pencil, and place the board flat on the band saw's table. Lower the blade guard so that the bottom of the guard is just above the level of the board, and lock the guard in place. Turn on the band saw, and position the pencil line parallel to the blade at the point where the blade should enter the wood. To make the cut, hold the board flat on the table and ease the board through the blade. Do not force the wood, but ease it through, allowing the blade to do all of the work. Focus on keeping the blade just outside of the pencil mark, as you can sand to the line easily using an oscillating spindle sander to perfect the cut. When you need to rotate the board to follow the curved pencil line, move the board right or left on the table as needed (once again, never lifting the board off of the table). Be sure to keep your hands well clear of the blade, and avoid reaching through the saw to the far side of the table. Continue rotating and easing the board until the entire profile is cut, then turn off the motor and lift the wood away from the table after the blade stops turning. The band saw can also excel at a variety of straight cuts. Resawing, cutting thin strips of veneer, or even rough-cutting lumber from logs (using a specially-designed sled) are all tasks that a band saw can tackle. For these straight cuts, you'll need the right blade plus a sturdy fence. The fence needs to be positioned parallel to the blade, typically on the left side of the blade. Veneers, thin strips of wood, can easily be cut on a band saw. Install a thin, fine-tooth blade that is at least 1/2-inch wide into the band saw. Adjust the guide blocks and drop the blade guard until it is just above the wood to be cut. Hold the board against the fence with the edge to be cut parallel to the blade. Adjust the fence until the desired thickness of the veneer is just to the far side of the blade from the fence. Turn on the saw, and ease the wood through the blade while holding the board firmly against the fence and the table. After completing the cut, turn off the saw, adjust the fence and repeat. TIP: To keep the board held evenly against the fence, install a featherboard onto the table to the right of the board in front of the blade. As you ease the board through the blade, the featherboard will hold it tightly against the fence. To resaw boards (the act of cutting thinner boards out of thicker ones), you'll want at least a 3/4-inch wide blade. The wider blade will reduce wandering and deflection. Additionally, the blade should have a narrow cutting profile, to reduce waste. Ideally, for making large resaw cuts, you'll want a fence at least as tall as the board, to keep the block of wood stable. Additionally, a jig to hold the block firmly against the fence (much like the featherboard used when creating the veneer, but one that holds much higher on the block than a traditional featherboard) will make the job easier. To complete the resaw cut, hold the board firmly against the table and fence, and ease the block through the blade. As with other band saw cuts, do not force the board forward. Instead, allow the blade to do the work and feed it only as fast as the blade can cut. Keep easing the block through the blade until it completes the cut. Then, turn off the blade, remove the board and the block, adjust the fence, and repeat. Another form of resawing that can be done on a small scale with a band saw is cutting boards out of a log. For this task, you'll need a sled to support the small log on the band saw table, using the miter saw slot as a guide. The sled will hold the log securely, preventing it from rotating, twisting or shifting while resawing, which would ruin the board being sliced off the log. After completing the cut, turn off the band saw, remove the freshly cut board, ease the sled back to the beginning point, re-position the log and repeat. 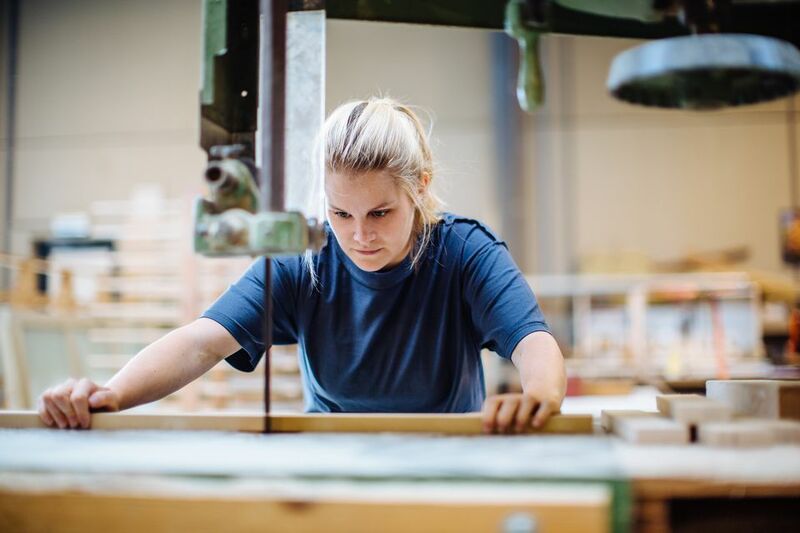 Do You Know the Best Safety Procedures for Using a Table Saw?